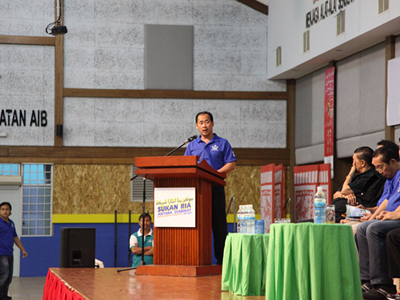 This is the third year running that the Sukan Ria Antara Syarikat is launched. It's also known as Inter-Company Sports Fest. The main objective of this fest is to provide a perfect opportunity for employers and employees to take time off to foster a closer relationship through participation in sports and activities. So what sports they are being included in this year's event? Well, there's basketball, badminton, futsal, bowling, hiking (12th May) and Tug-of-War (17th May). The organisers of this year's event are Labour Department from Ministry of Home Affairs and Event Manager Sunlit Advertising. 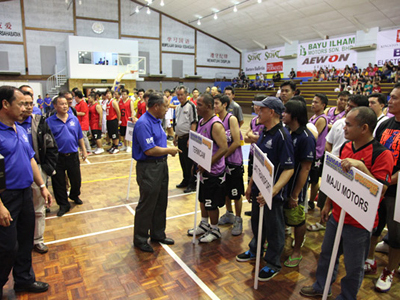 THE Sukan Ria Antara Syarikat 2013 was launched yesterday at the Darussalam Hall in Chung Hwa Middle School which also serves as the beginning of the Inter-Company NBT Basketball Tournament, the first of the various sports tournament to be held during the month of May. The Managing Director of Sunlit Advertising Sdn Bhd Jackson Ting, in his welcoming speech, expressed his appreciation for all individuals, especially from the companies members as well as the supporters of this event whom have contributed to make this event a success.